Behold! 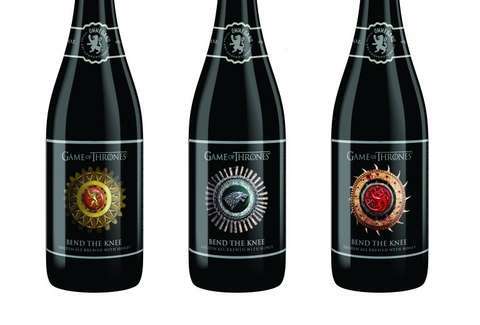 The Next 'Game of Thrones' Beer Is Coming, and It's Golden. It's been more than six long, cold months since the epic Game of Thrones Season 6 finale. With no definite premiere date for the seventh season, fans can at least drink away their anxiety: Brewery Ommegang has announced a new official Game of Thrones beer called Bend the Knee golden ale. The 9% Belgian-style golden will come in 750ml bottles featuring the sigils of the Stark, Targaryen, and Lannister houses. It's set for release on Memorial Day. That might seem like a long wait, but given that three months is the time it takes author George RR Martin to write half a page, at least it's something fans are used to. This is the eighth beer in Brewery Ommegang's collaboration with the HBO show, which began in 2013 with the aptly named Iron Throne blonde ale. Other brews include the Take the Black Stout, Three-Eyed Raven saison, and Valar Dohaeris tripel ale. Alas, it never launched its Joffrey gose, mainly because nobody would have liked it. Ciera Velarde is an editorial production assistant at Thrillist who has taken serious eyebrow inspiration from Daenerys Targaryen. Follow her on Instagram.